Casey and Cardinia have been included in a severe thunderstorm warning for damaging winds, large hailstones, and heavy rainfall. 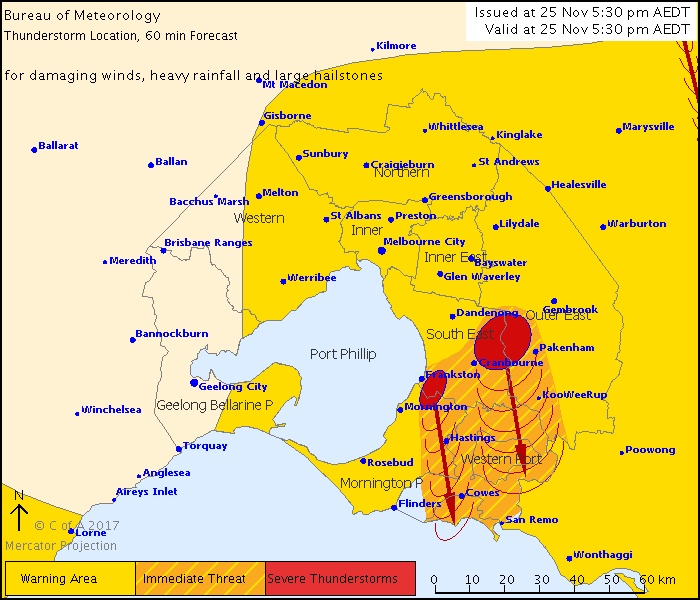 Almost half of the state is covered by a severe thunderstorm warning, but Melbourne’s outer east has been specifically highlighter by the Bureau of Meteorology. The warning below is from the BoM, issued at 5.30pm today. Click here for the latest warnings. 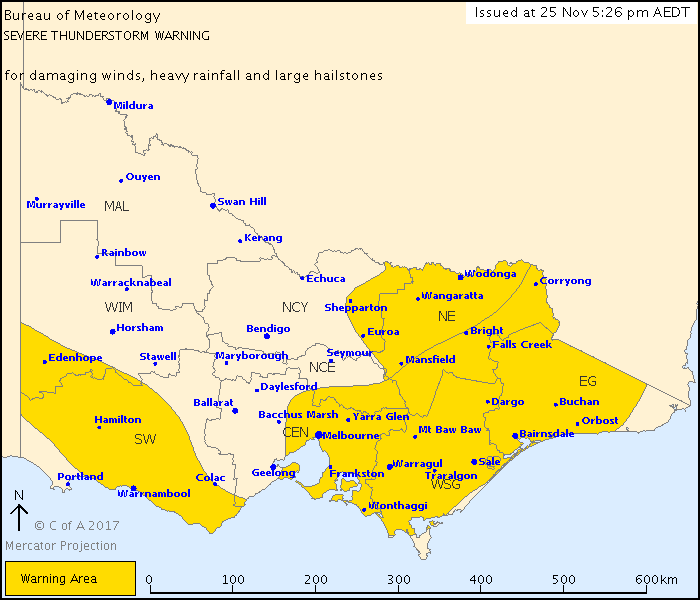 “The Bureau of Meteorology warns that, at 5:30 pm, severe thunderstorms were detected on the weather radar near Berwick, Cranbourne, the area east of Mornington and the area north east of Marysville. These thunderstorms are moving towards the south. They are forecast to affect Hastings, KooWeeRup and Pakenham by 6:00 pm and Lang Lang, Phillip Island and the area north of Bass by 6:30 pm. “Damaging winds, heavy rainfall that may lead to flash flooding and large hailstones are likely. Move vehicles under cover or away from trees. Don’t drive, ride or walk through flood water. Be aware that in fire affected areas, rainfall run-off into waterways may contain debris such as ash, soil, trees and rocks. Be alert that in areas recently affected by fires, heavy rainfall increases the potential for landslides and debris across roads. “The next warning is due to be issued by 6:30 pm. Above: the statewide map. Source: BoM.